Today’s well-appointed luxury kitchens inspire culinary creativity by combining modern technology with custom design features. The kitchens in this gallery incorporate all of these features, and much, much more. 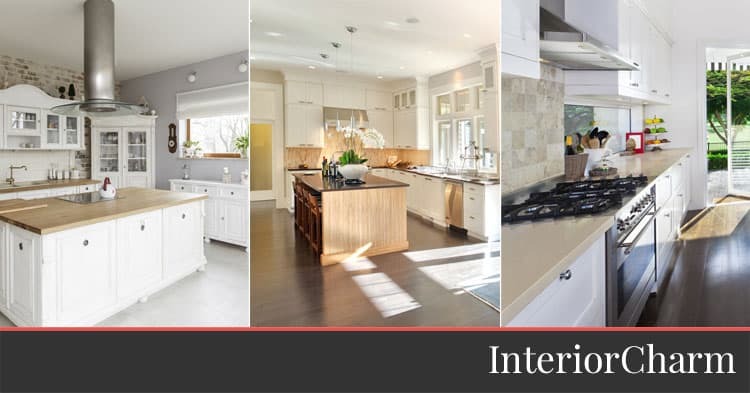 You’ll find the latest in kitchen trends, high-tech appliances, gorgeous finishes and time saving amenities to make your kitchen the ideal space for gourmet cooking and upscale entertaining. 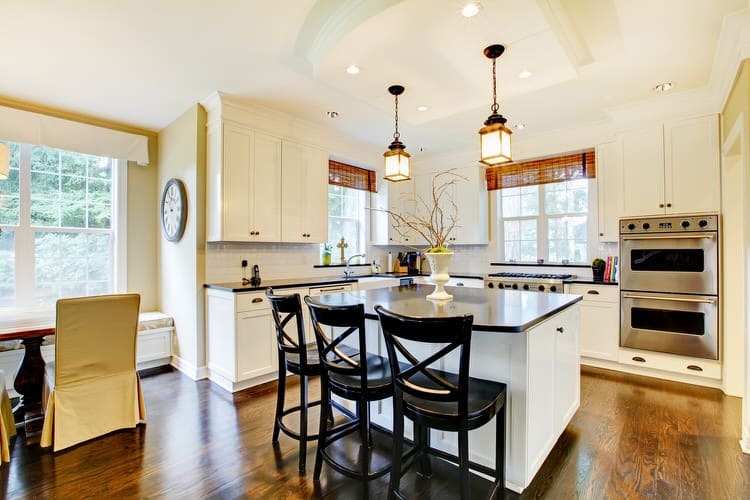 This elegant and traditional kitchen is a veritable feast for the eyes. 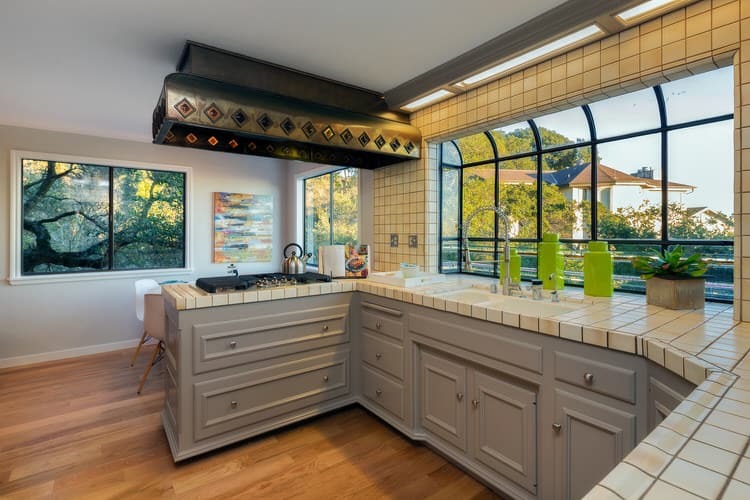 The juxtaposition of surfaces and colors creates drama and interest in this oversized galley-style kitchen. 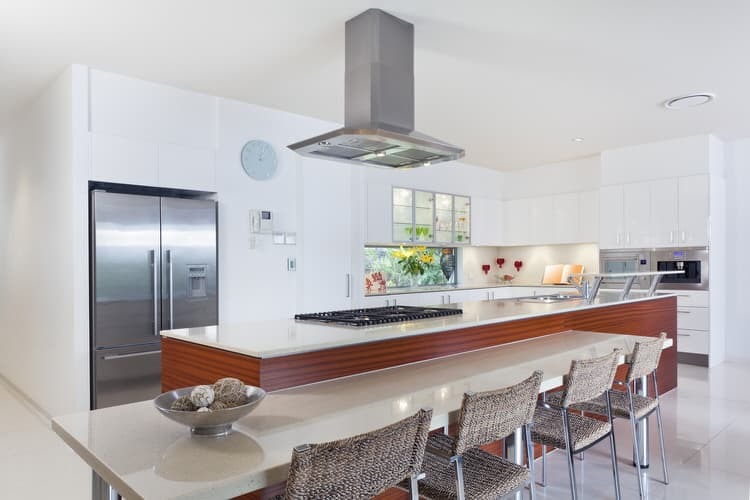 The variety of finishes and materials break up the space, making an elongated kitchen feel warm and inviting. Your resident chef would be oh-so happy in this industrial-chic command center. Almost everything in the kitchen is reminiscent of metal—right down to the cabinet fronts and island surround. High gloss exotic wood flooring brings in a touch of warmth and makes for easy cleanup. Quad ovens, dual warming drawers and a massive refrigerator equate to epic holiday dinners! What is black and white and makes your mouth water? A high tech kitchen with mirror-like lacquer surfaces, loads of storage and a host of integrated features. The pièces de résistance are the sustainable bamboo flooring and coordinating backsplash used to neutralize the stark, ultra-modern black-and-white palette. Old World luxury meets modern convenience in this artful merging of styles. An induction cooktop is highlighted by butcher block counters and crowned with an industrial island vent hood, making for a whimsically functional kitchen island. Gleaming stainless appliances are the perfect counterpoint to white farmhouse cabinets and distressed brick walls. 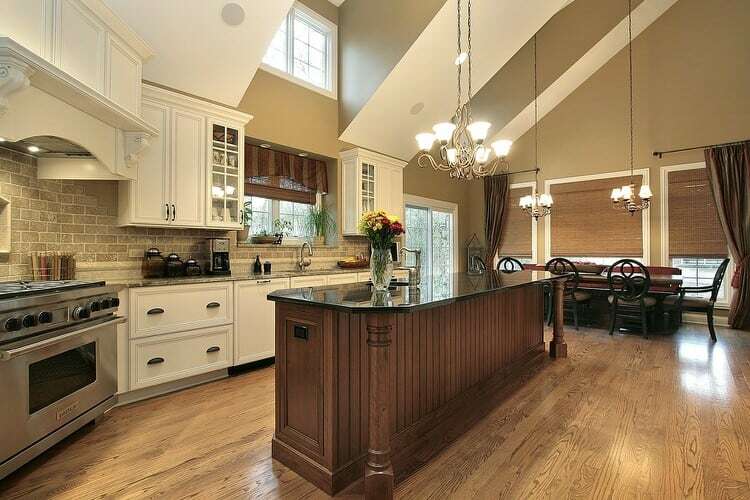 This expansive and gorgeous kitchen is tailor-made for casual entertaining. Nothing beats an integrated kitchen, dining and living space. 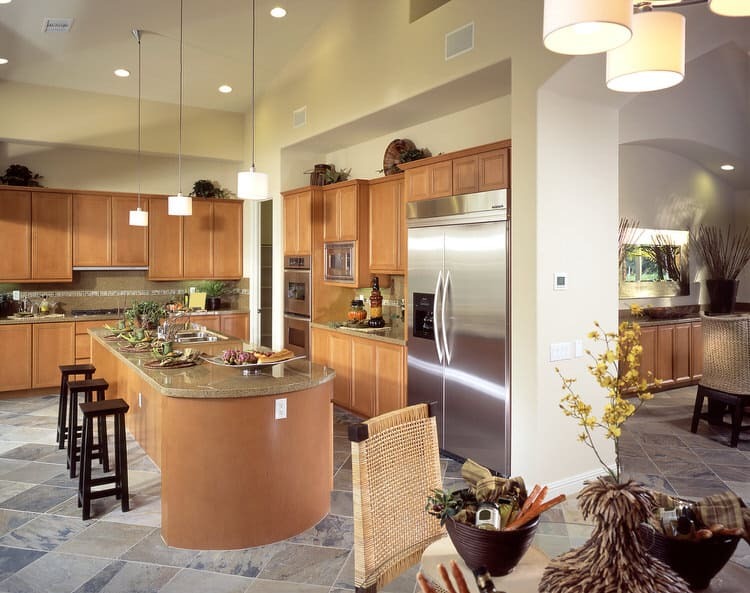 This type of open floor plan kitchen invites guests to linger around the island, chat with the chef and even help out with the cooking and clean-up. 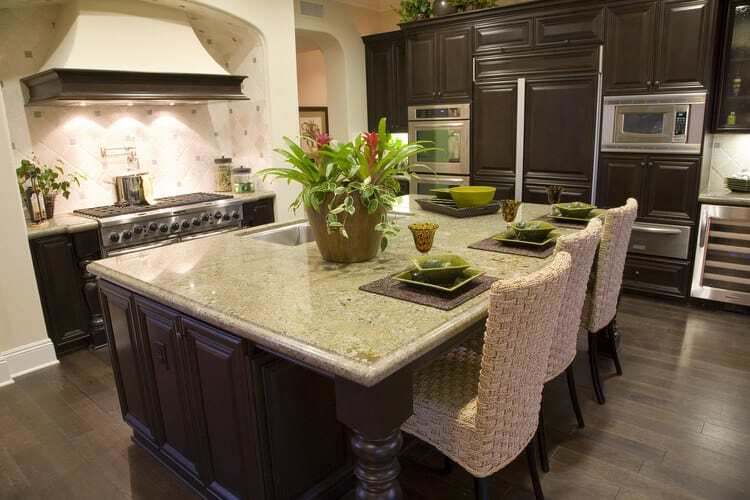 The focal point of this family kitchen is its grand island. The long, soapstone topped work center provides ample space for homework and food prep, built-in seating and an end-cap shelf for cookbook storage. 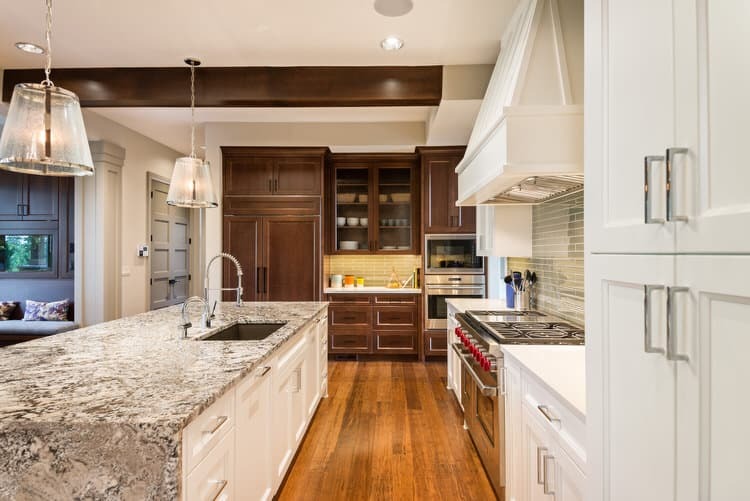 Floor-to-ceiling maple cabinetry, ample lighting and stainless appliances round out the Craftsman-inspired design. Crisp and clean is the theme of this classic kitchen. Bright Shaker cabinetry, linen-hued quartz countertops and Travertine tile backsplash and a white farmhouse sink literally pop against the wide planked chocolate flooring. A 6-burner stainless range and delicate wire pendant fixtures are the bling that complete this luxury kitchen ensemble. The designer of this thoroughly modern kitchen chose to break up the expanse of white cabinets and flooring with a multi-level island faced with cherry beadboard. The effect is both stunning and highly functional. 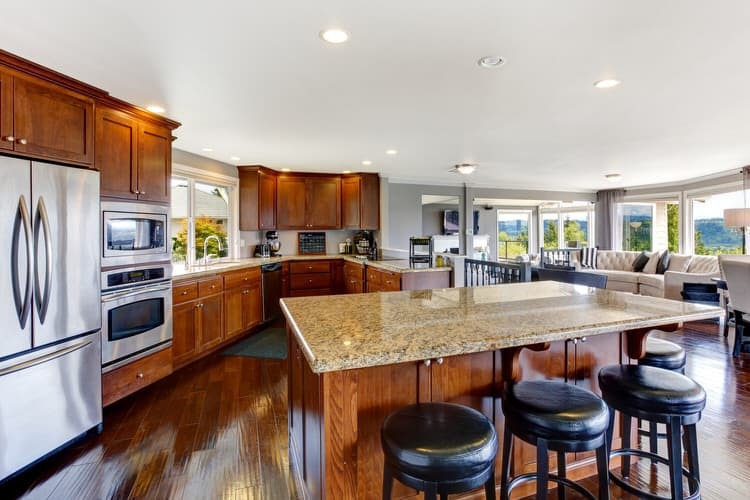 The upper tier is strictly utilitarian for cooking and food prep, while the lower level seats the kids for breakfast or a group of friends for a impromtu wine and cheese tasting. Equilibrium and consistency are the foundation of this combination kitchen and dining area. The two areas are visually linked through the clever use of color and finishes. 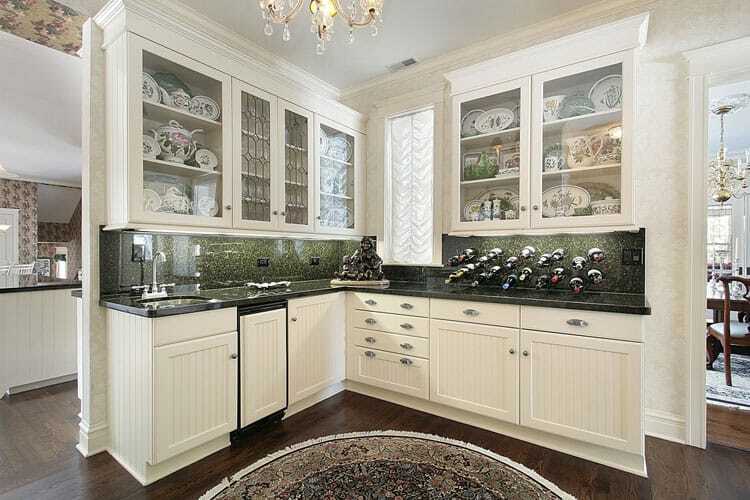 Espresso cabinets in the kitchen are echoed in the dining area’s built-in buffet. Natural linen upholstered seating bridges the divide between the two spaces. The silver mirror and accessories mirror the shimmer of the stainless appliances. A variety of finishes and a unique arrangement gives this modern kitchen an avant-garde, yet familiar feel. 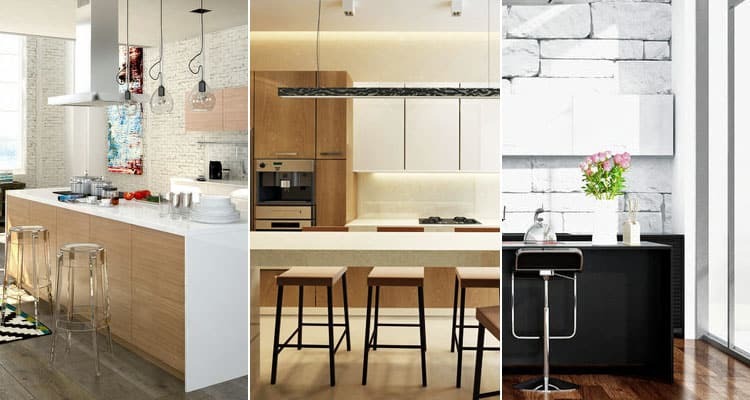 What used to be considered conventional kitchen design is no longer the norm in some high-end kitchens. 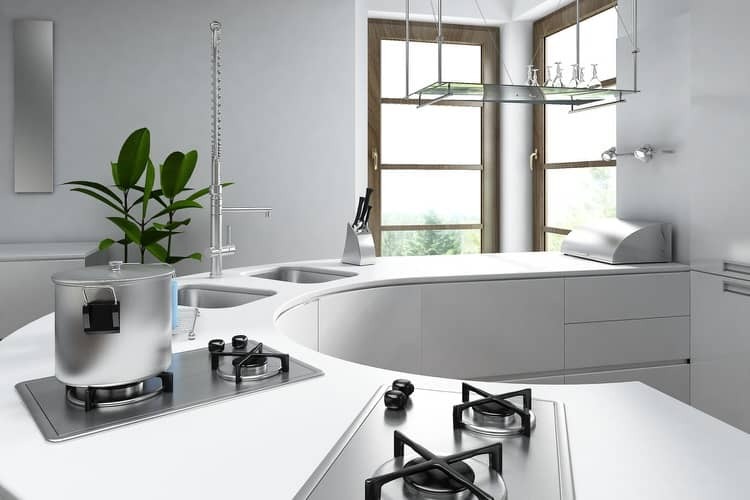 The lack of a traditional work triangle doesn’t even pose a problem when you consider the perfect peninsula placement and functional layout of counter surfaces. 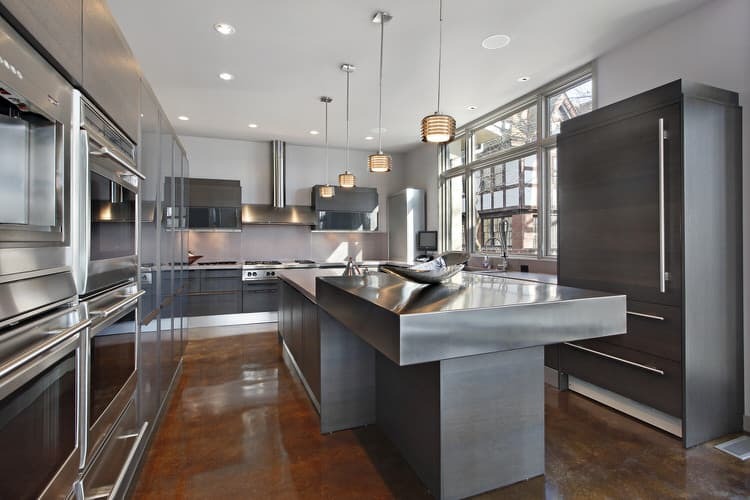 This striking kitchen could be the centerpiece of any fashionable, uptown bachelor pad. 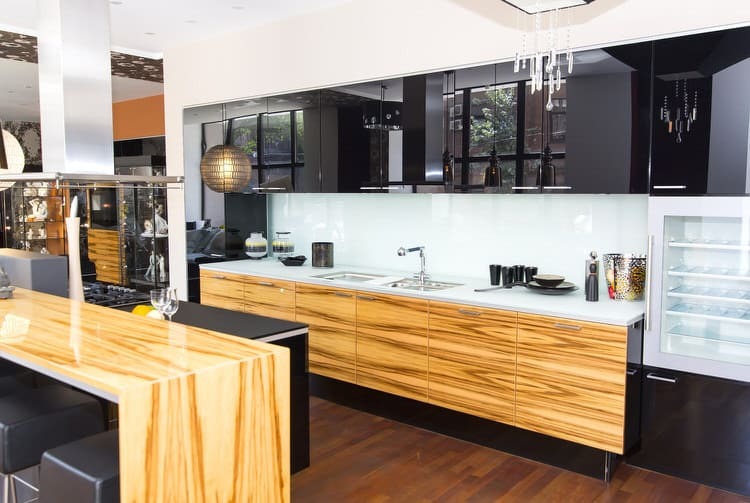 The minimalist energy of black plexiglass upper cabinets paired with sensual zebrawood gives the room a sense of masculinity and refinement befitting the 21st century male. Country kitchens aren’t home to geese, apples and sunflowers anymore. This beautiful down-home kitchen design does exhibit some touches of traditional country, such as gingham window toppers, beadboard cabinet fronts and an antiqued wood finish. However, the effect is restrained, not kitschy. This contemporary version of the country kitchen is all about natural elements, functional fixtures and understated elegance. 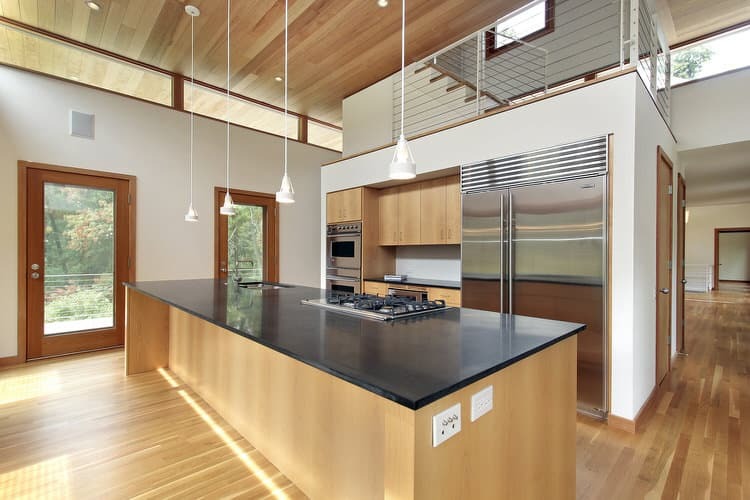 Warm wood tones and black honed granite set the stage for this ultra-modern cabin in the woods. Upper windows and large glass doors are designed to bring nature into this spectacular kitchen. Add to that a commercial sized refrigerator, double ovens and a gas cooktop and you have created a cook’s Nirvana. It is so easy being green in this kitchen fit for royalty. 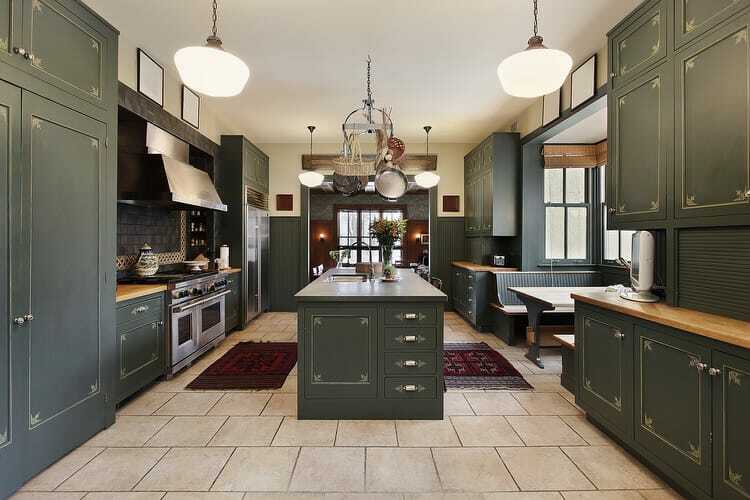 Towering cabinets in a dark green hand-rubbed finish remind us of a kitchen in a stately manor house. The large-scale floor tiles, elaborate pot rack and antique reproduction light fixtures lend themselves to the fantasy as well. Architects use tricks to give the impression of space in rooms that could use a little more. The overall layout of this kitchen takes full advantage of every inch of available space and allows for decent traffic flow. Ceiling height also gives the illusion of additional space. 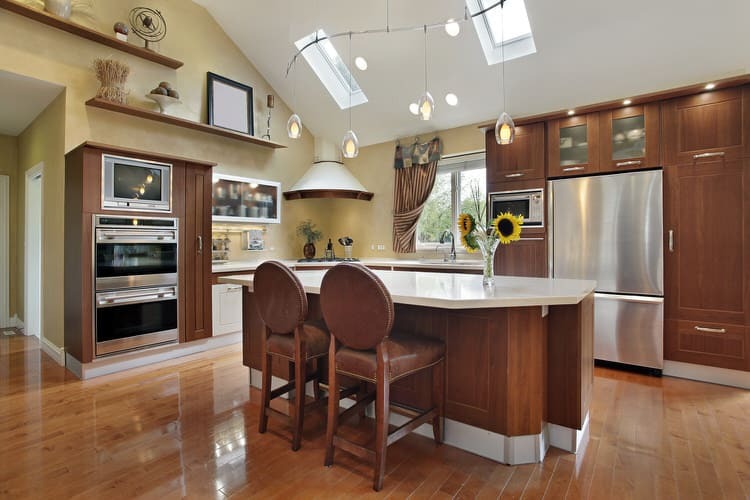 The optimized layout and lofty ceilings work together to make the most of this attractive kitchen. 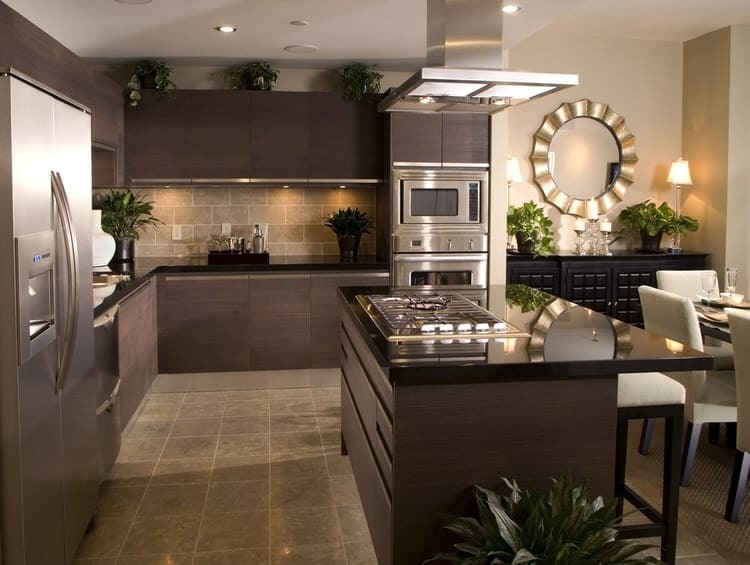 Nothing says a luxury kitchen has to be big in size in order to make a big impact. The curvilinear counter looms large and leaves the kitchen visually open to adjoining spaces. This petite space has double the influence—a commercial faucet services dual sinks and split gas cooktops let the chef divide and conquer a meal. 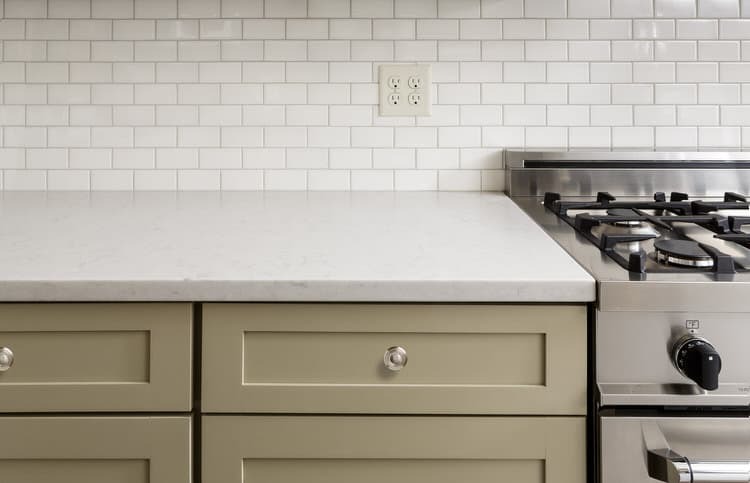 Give your kitchen a custom look by installing a glossy subway tile backsplash, quartz countertops and a stainless range and appliance package. If your cabinets are looking a little worse for the wear, dress them up with coat of paint in a designer color and new hardware. 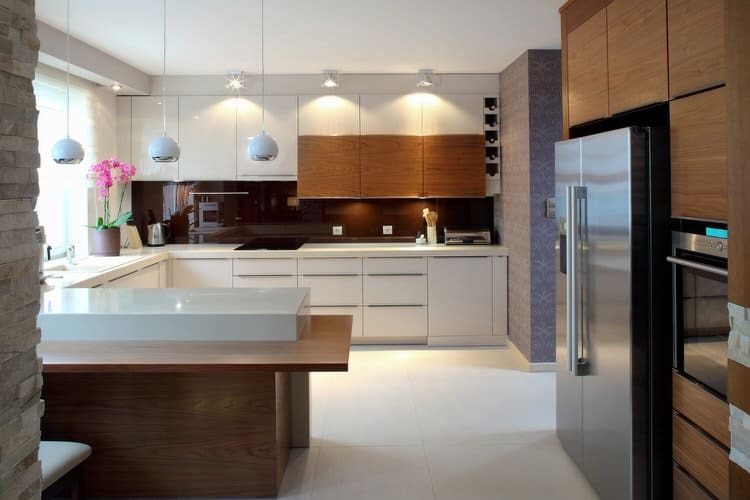 Switching out light fixtures is an easy and inexpensive way to add instant luxury to your kitchen. 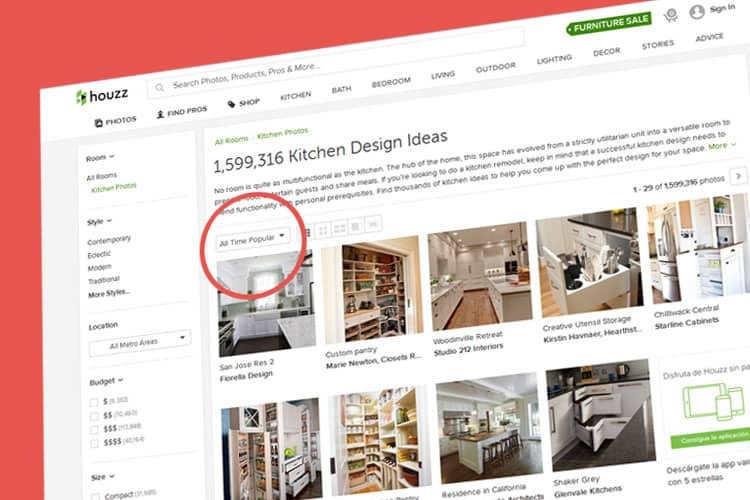 Here’s a kitchen design concept that’s a blast from the past—and it is still going strong. Bump-out garden windows offer the resident cook extra space to cultivate a variety of culinary herbs year-round. Not only do these large windows enhance the kitchen’s natural light, they also take full advantage of million-dollar views that might be otherwise ignored. A kitchen without windows is not the end of the world. Sometimes loft and high rise condo kitchens are situated away from windows and must pull light from other sources. Recreate natural illumination by using a mix of light cabinetry, reflective tiles and recessed fixtures like this high-end kitchen. 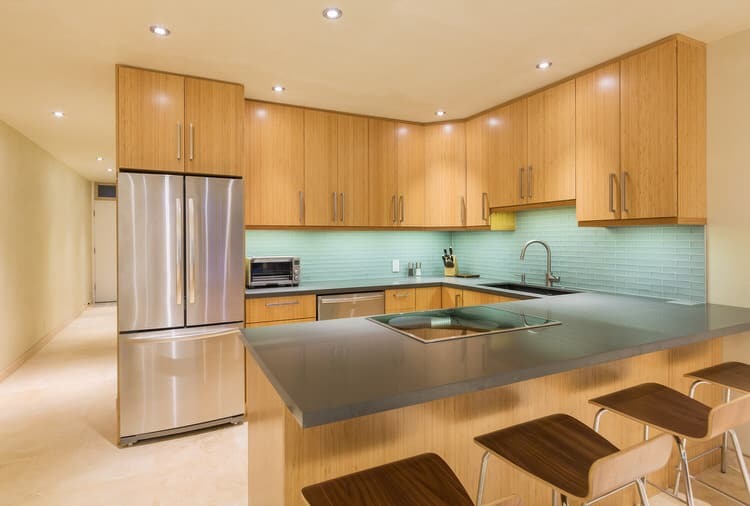 Scandinavian blond wood and aqua glass tiles do wonders in this closed off kitchen space. 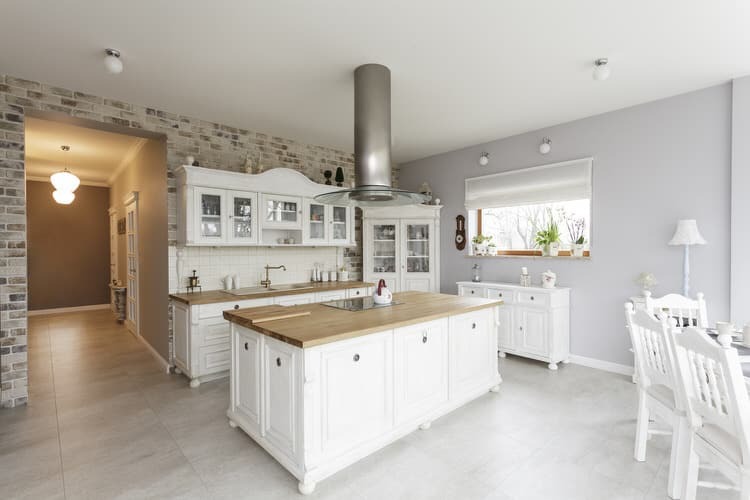 A seemingly intimidating kitchen layout is actually a dream to behold. Fridge and freezer drawers are located within the island along with an induction cooktop, totally cool range hood and an extra large sink. If you’re tall enough to reach, there’s floor to ceiling storage with multiple ovens for your baking and roasting convenience. The travertine wall adds a welcome textural element in a sea of smooth surfaces. We love traditional elements like slipcovered dining chairs, a turned pedestal dining table, window valances, prairie style lighting and a cozy window seat. 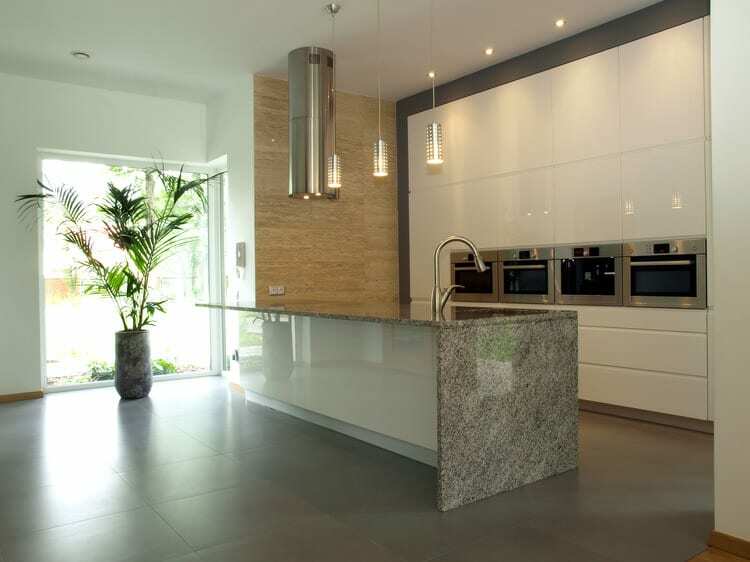 Don’t you think they seem quite at home in this contemporary kitchen setting? This elegant aesthetic proves you can pair the classics with the latest in kitchen technology for a timeless design. 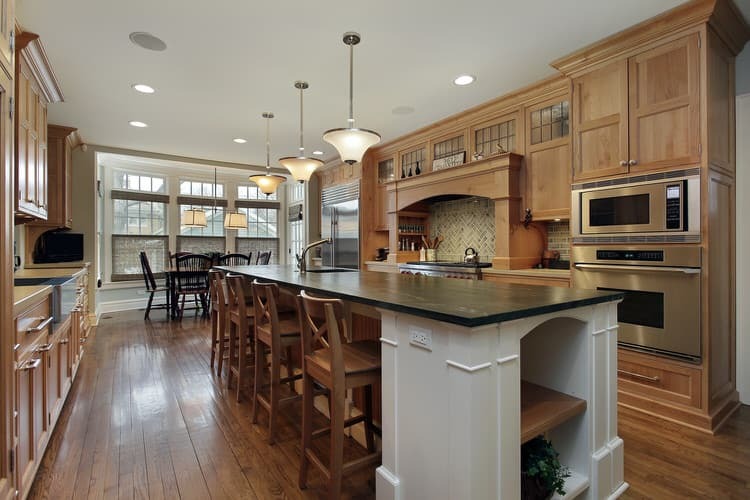 You might think lighting would be a problem in a formal kitchen with high, angled ceilings. 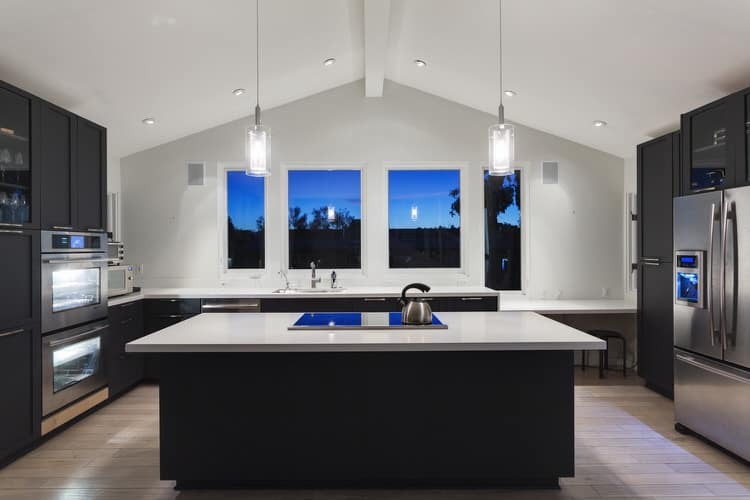 This architecturally endowed kitchen takes full advantage of the situation with dramatic pendants, recessed fixtures and high windows that provide plenty task, ambient and accent lighting. This mansion plays down its pedigree with a redesigned casual, open-concept kitchen and dining area. Influenced by the view of the beach from the picture windows, the colors of sand and driftwood are evident in everything from the light beige paint color to the weathered dining furniture. Symmetry is the name of the game in this state-of-the-art kitchen. The visual weight of the room, including the windows, lighting fixtures and appliances is totally balanced, creating a sense of harmony in the busy heart of the home. The divider is the center beam of the vaulted ceiling. 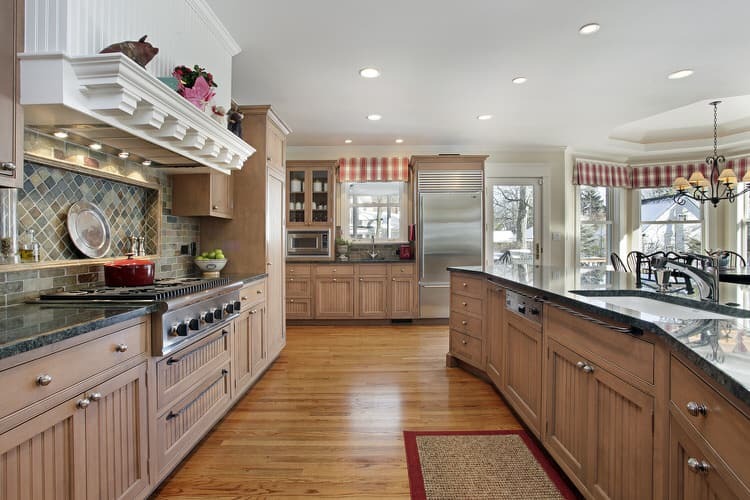 British colonial flair reigns supreme in this mix of formal and casual kitchen styles. British colonial style dates back to 17th century Caribbean outposts and is a relatively easy style to replicate in any kitchen. Dark carved woods, rattan seating and tropical plants all add to the feel of this enduring island style. Here’s an eclectic kitchen for a modern family. From the contemporary Louis counter stools and old school range hood to the open decorative open shelves and curved track lighting, this unrestrained kitchen has a distinctive personality and doesn’t take itself too seriously. The end result is unbridled perfection. A Danish modern vibe enhances this urban loft kitchen. The slender curves of the raw wood peninsula create a subtle division between the galley kitchen and adjacent living area. 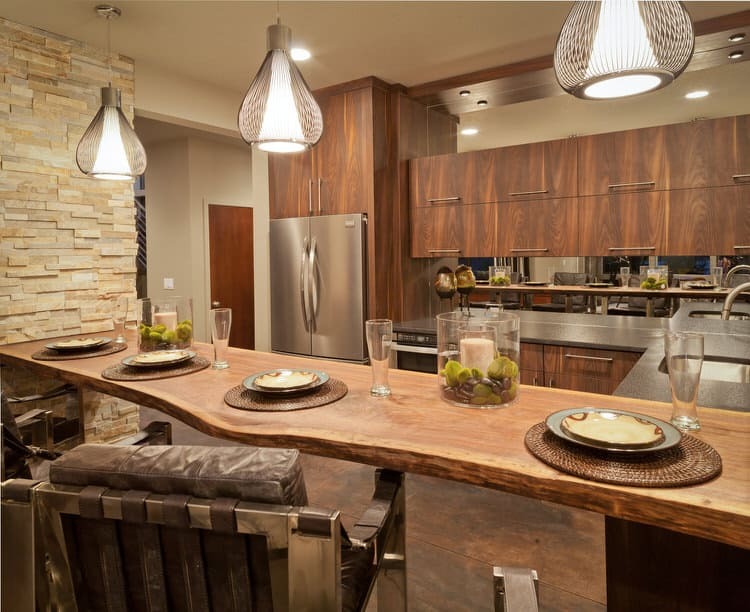 Organic shapes, stone veneer and variegated wood tones play off stainless counters and top-of-the-line appliances. Throw in the retro curved-arm counter stools and you have a recipe for a mid century kitchen. 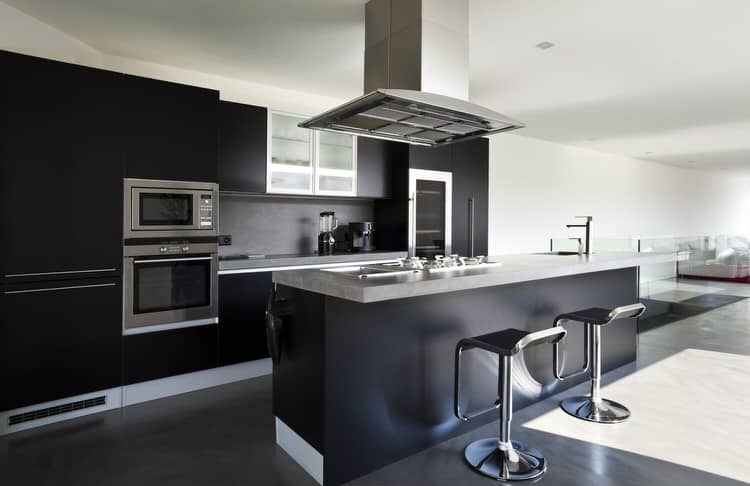 If you are ready to indulge your senses with a rich, dark and sophisticated kitchen, then consider the color black. While considered intimidating, black imparts instant drama that will transform your kitchen into an unforgettable space. 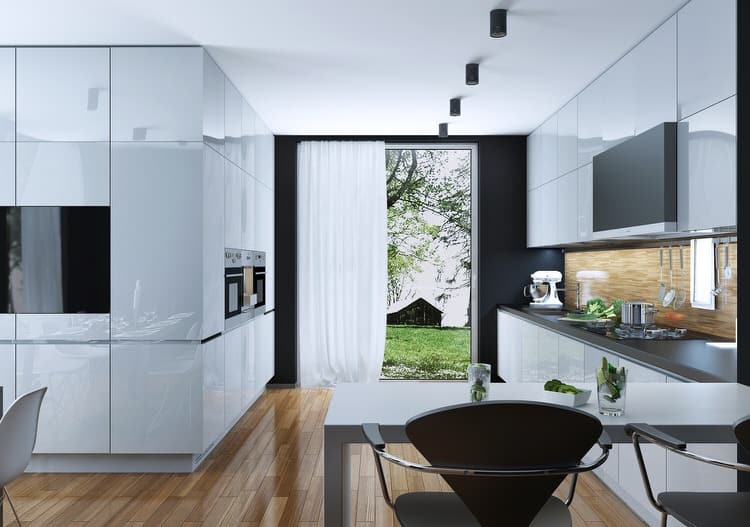 When done properly, black lends a sense of modernity to your kitchen, whether it is used as an all over color like the kitchen above or simply as an accent. 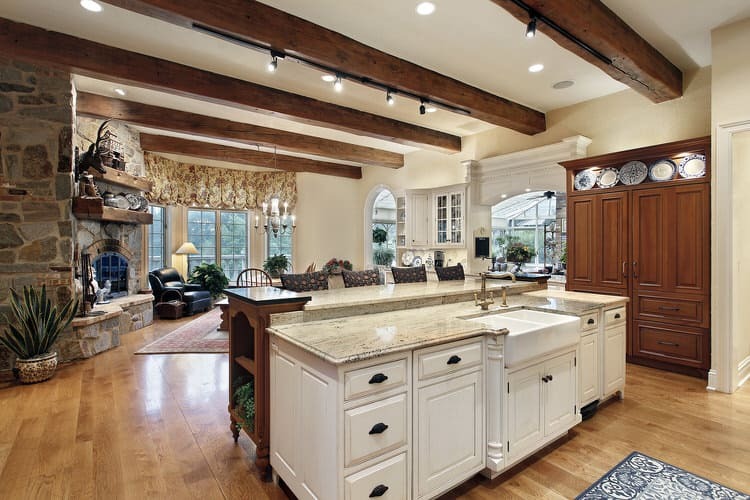 This kitchen is the perfect example of how to achieve rustic luxury. Have fun and mix your materials. Create custom storage that resembles individual furniture pieces. Add cabinet fronts to hide modern appliances. Add architecture where there was none by installing rough-hewn ceiling beams. Build or resurface a fireplace with stone laminate—and voila! Our spacious penthouse kitchen combines dark finishes, jewel tones and natural stone to set the stage for enchanting evening entertaining. The opulent merlot paint color on the far walls draws you in, making the kitchen seem more intimate and highlighting design elements like the flooring, backsplash and chandelier.